As a young child, school was Antwinae McNeil’s saving grace. She always saw it as her ticket to a better life. But her abusive mother knew that and kept her home from school as punishment. Trusting in herself and her capabilities, and despite years of trauma and neglect and being caught up in the foster care system, McNeil graduated from high school and made her way from a Detroit shelter to Western Michigan University. McNeil completed her first year as a Seita Scholar with a 4.0 GPA and says the opportunity to attend WMU brought her from the depths of despair, from thoughts of suicide, to hope for the future. She feels it was a gift and says it saved her life. An innovative, comprehensive support program for foster care youth, Sieta Scholars accepted its first class in fall 2008 and will have nearly 150 graduates when the program celebrates its 10-year anniversary this September. The program, and WMU, has garnered national acclaim, most recently by the Honor Society of Phi Kappa Phi, which named WMU as the 2018 recipient of its Excellence in Innovation Award. Seita Scholars aims to expand accessibility to college and increase successful outcomes among young adults who have lived some or all of their teenage years in foster care, especially those who are aging out of the foster care system. Often, foster care youth don’t feel college is even an option. Many are struggling to meet day-to-day needs such as housing, food, and safety, says Dr. Yvonne Unrau, director of Center for Fostering Success and one of the founders of the Seita Scholars Program. Seita Scholars, named to honor Dr. John Seita, a three-degree WMU alumnus and national advocate for foster care youth, has garnered buy-in from all levels of the university and become a point of pride for the entire WMU community, Unrau says. The program has received support from Department of Health and Human Services, foundations, and private donations but is funded through the university’s general fund. The program evolved after Unrau, a professor in the School of Social Work, and other administrators attended a summit highlighting the issues facing youth who age out of foster care. At that time, foster care youth aged out at 18 years old. Today, they can voluntarily opt to stay in foster care until age 21, but they often have to navigate adult responsibilities such as finding housing, employment, transportation and health care without adult support. Those who work with foster care youth realized there was a segment of students who were academically eligible to attend a four-year institution. In the first year, Seita staffers estimated they would have 15 students and ended up with 51 students, Unrau says. 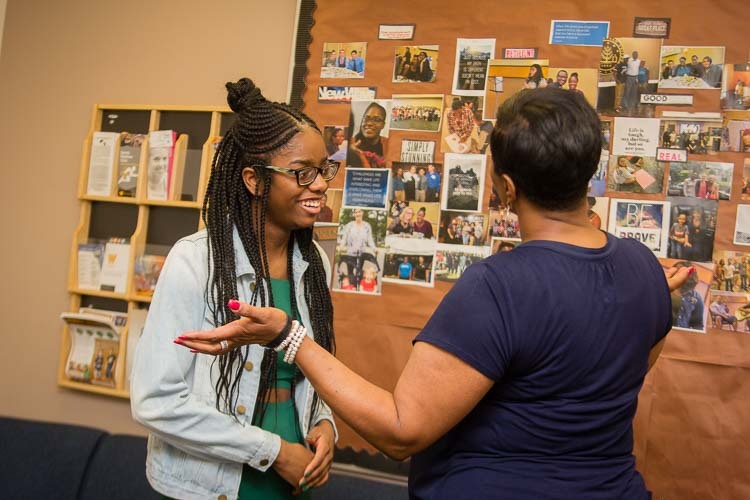 WMU’s Seita Scholars spread through word of mouth and became a destination program for caseworkers, school advisors, and foster parents to refer eligible students and help connect them to resources and make the transition to college, Unrau says. Today, about 150 former foster-care youth are at home on the WMU campus and working toward their degrees. The program now has a career and peer mentor program and a steady pool of volunteers and donors who help make welcome baskets and supply the students with items for their dorm or whatever else they need. Open to students across the state, Seita Scholars must apply to WMU like any other student and meet certain criteria to qualify and maintain eligibility each semester. Although the scholarship does not cover all of their expenses, many qualify for other scholarships and financial assistance and the goal is for them to graduate with minimal student loan debt, Unrau says. Yvonne Unrau, director of the Center for Fostering Success chats with Seita Scholar Antwinae McNeil. Photo by Susan Andress Scholars receive a renewable scholarship, have access to year-round on-campus housing and one-on-one support and mentoring from a Campus Coach throughout their collegiate career. 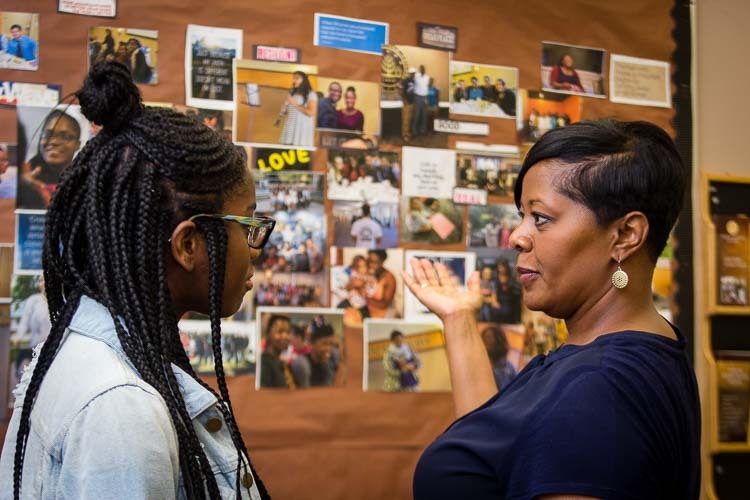 Campus Coaches are specifically trained to assist scholars with academic and personal issues and provide mentoring and support in seven life domains: academics, finances, housing, physical and mental health, social relationships and community connections, personal and cultural identity, and life skills. Besides coping with trauma and trying to meet basic needs, leaving foster care can be an isolating experience so Campus Coaches help students find ways to connect on campus and create a sense of belonging and community. The program’s focus has shifted to increasing retention and graduation rates and helping students transition into a career. McNeil and her four younger siblings dealt with CPS for most of her childhood, but she wasn’t removed from her mother’s care until age 15. That’s when she got caught up in what she calls a “broken” foster care system. While most teenagers worry about their next phone upgrade or high school sporting event, McNeil worried about where she was going to sleep at night or when she might have her next meal. She didn’t come home to loving foster parents and family dinners as teens are tough to place. Instead, McNeil’s foster care worker also operated an independent living facility where McNeil lived with other foster care youth in substandard conditions. When McNeil reported the situation, she ended up in a transitional shelter for teenage girls. Still, she continued to attend Chandler Park Academy High School in Harper Woods and learned about Seita Scholars after a WMU representative visited her school. With the help of her high school advisor, she applied to the program, interviewed with Seita staff members and patiently waited. She finally received the call that changed her life. For this group of students, it’s important they see stability and know Seita Scholars is not a temporary program, Unrau says. That is why WMU has a permanent office and permanent staff, and students meet with coaches weekly and check in via text and email. There is always a coach on-call in case a student runs into an emergency or crisis situation. Many students need help navigating college bureaucracy, dealing with professors and roommates, and basic life skills such as grocery shopping, budgeting, and figuring out career goals. Others need help with interview skills and attire, accessing medical or mental health services, or don’t know how to buy, register, and maintain a vehicle. Many have unresolved issues with biological family members or worry about younger siblings still in the foster care system. Seita Scholar Antwinae McNeil appreciates the warmth and caring she has received from the program. Photo by Susan Andress By the time students graduate, the goal is for them to be self-coaching and figuring out how to solve their own problems, overcome challenges, and become successful adults. 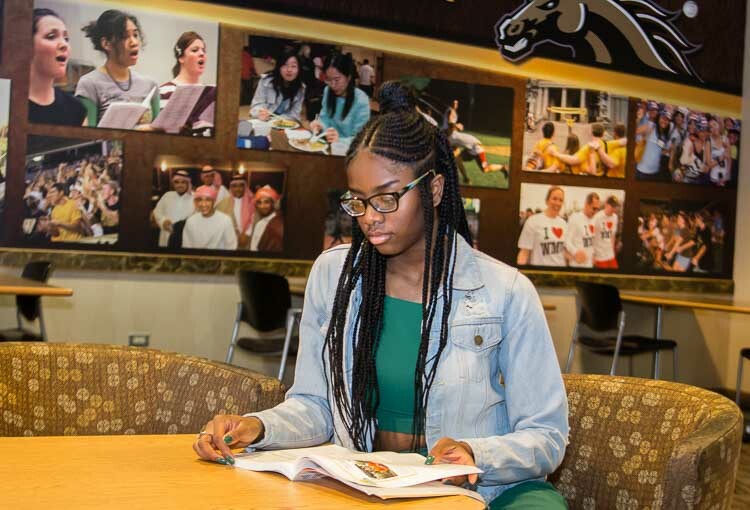 McNeil feels like she has a new family at WMU and credits her Campus Coach Lakeyla Whitaker with helping her ride out the summer between graduating high school and arriving at campus. A year into the program, she says she has never met such warm and caring people who truly care about her success and wellbeing. She enjoys visiting the Seita Scholars office and plans to work as a peer mentor for incoming Seita Scholars. She plans to major in psychology, with a concentration on behavioral analysis, and wants to work with criminals, foster care youth, and youth who experience trauma. “I want to help change and rewrite the system because it is so broken,” she says. Unrau has heard countless stories of lives being transformed, but program supporters believe it changes generations of family dynamics along with breaking cycles of poverty, abuse, and neglect. Nationally, only about 5 percent of young people who age out of foster care will earn a four-year college degree. The Seita Scholars program has a 30 percent graduation rate. 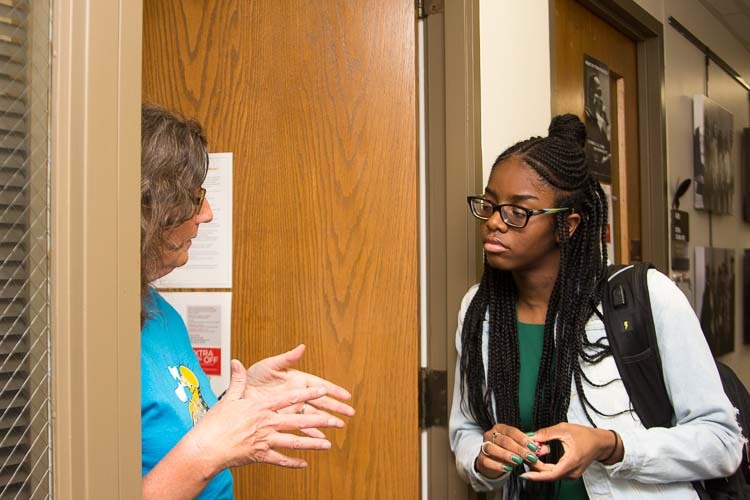 Through its efforts to expand opportunities and improve outcomes for foster care youth, WMU’s Seita Scholars Program has grown into the nation’s largest and most comprehensive outreach program for young people who have aged out of foster care. Seita Scholars has spurred research, training, collaborations and larger policy initiatives in the state and beyond. In terms of the lessons learned, Unrau says figuring out how to solve the barriers and challenges of foster care youth accessing and graduating from college can be applied to other student populations. It also continues as they transition into the workforce. In 2012, WMU established the Center for Fostering Success, which conducts research on foster care and higher education and has trained campus coaches for foster youth in nine states. That led to the creation of the statewide network Fostering Success Michigan, which also operated under the Center, to disseminate best practices and help other colleges and universities provide opportunities to former foster care youth. Center for Fostering Success is staying based at WMU, but has plans for a summer of transitions, reorganization and personnel changes. The WMU Center announced a new partnership with The New Foster Care, a Bloomfield Hills-based organization working to create positive systemic change in Michigan’s foster care system, to take the lead on continuing to build Fostering Success Michigan’s network of organizations, professionals, and key stakeholders. Fostering Success Michigan has helped expand campus support programs for students with experience in foster care from five to 18 Michigan higher education institutions, serving an average of 335 students annually, and supporting more than 214 students to graduation since 2012. The website FosteringSuccessMichigan.com has become a leading national resource for those working in foster care and higher education and is the host site for the National Postsecondary Support Map.